Where would we be without the English Bible? How many people would never have read the Word of God for themselves? 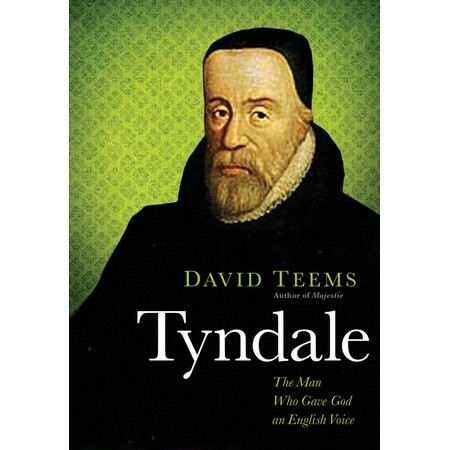 In “Tyndale: The Man Who Gave God an English Voice” David Teems takes us through a time in history when translating the Bible into English was considered heretical and criminal. He follows the path of William Tyndale’s life as Tyndale put together the first English Bible translated from the original Greek and Hebrew languages. The title of the book is a bit misleading. This isn’t really a biography like we’re used to. Not much is known about Tyndale outside of his written work. What is known about him personally has a lot of speculation around it. The subtitle captures the idea of the book more closely. There is a lot of information surrounding Tyndale’s English Bible. We get to see how Tyndale chose the best fitting words for the translation, the drama of the times, Tyndale’s exile and arrest, and how Tyndale has effected both literature (including Shakespeare) with his style and our modern English with words he introduced for the first time. However, Teems doesn’t just focus on Tyndale. We also learn a good bit about Thomas More, Tyndale’s biggest adversary (and the author of the famous “Utopia”) as well as other key people involved in the translation, both for and against Tyndale. I had two problems with the book. The first is really a minor issue of just a little annoyance and I guess sort of a pet peeve for me: Teems often changes how he refers to King Henry VIII. Changing from Henry VIII, to H8, to Harry. If I remember correctly, the very first reference to the King is H8. At that point I had only assumed Teems was referring to Henry VIII, but as the book went on I saw that he used the Henry VIII and H8 interchangeably. Then I see “Harry” thrown in there and that kind of threw me. It’s not until a couple of “Harry” references later, in the last chapter or so, that we are told Henry VIII preferred to be called “Harry.” The second issue is a bit more serious in the way the book is organized. It doesn’t really follow a straight timeline. The chapters are somewhat theme-based and so it tends to jump around in time a bit, which left me feeling a bit disconnected at times. What I loved about this book is the obvious respect, and I might even say affection, that Teems has for Tyndale. He talks about Tyndale as if he’d known the man for years. When the author cares that much, it’s hard not to feel drawn in by it. This is the official book trailer (shared from David Teems’s website). I received a complimentary copy of this book for review purposes from BookSneeze. Sounds like an interesting story but I can see how you could become frustrated also. The history is definitely interesting, and the information provided is essential reading for Christians, especially English-speaking Christians. We owe a great debt to William Tyndale.